If you need a dish to bring to a party – look no further than this recipe. 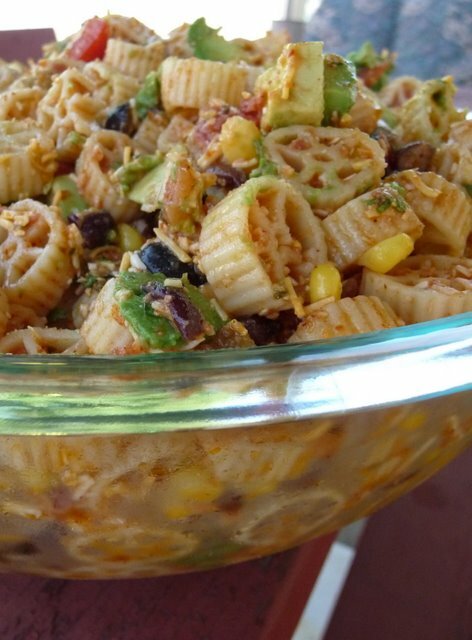 It is the perfect pasta salad that is sure to please a crowd. It is healthy, fulfilling and absolutely delicious. It is a combination of Mexican flavors – including cilantro, corn, black beans, salsa, avocado and a flavorful mix of lime juice, olive oil and spices. I only made one slight addition to this recipe and that was adding some sliced black olives – but if you don’t like them you can definitely omit them. Also, this recipe makes a lot – so if you are not feeding a crowd – you should definitely halve it. It was definitely a winner with my family (Hi Aunt Marilyn – I know you wanted this recipe! :) ) – and I know why it is so popular with other food bloggers – you must make this dish!! Enjoy! 1. Cook the pasta al dente according to package directions. Drain and rinse with cold water. 2. 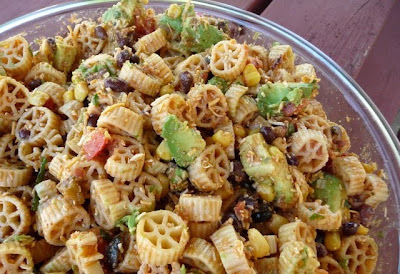 In a large bowl (4 quart), combine the black beans, corn, tomatoes, salsa, olives and cheese. Add the cooled pasta and mix well. 3. In another bowl, whisk together the olive oil, lime juice, garlic, cumin and chili powder. 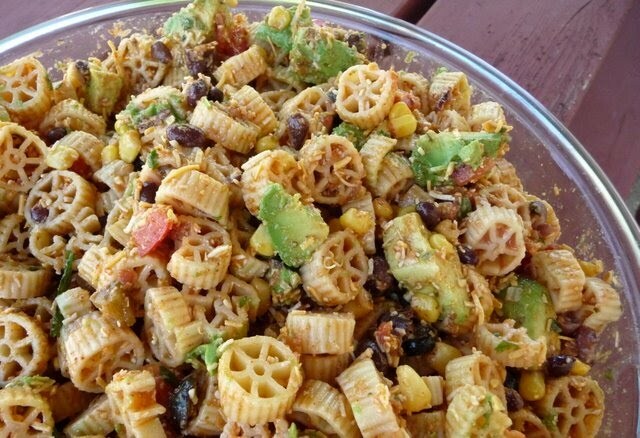 Pour over the pasta salad, add the cilantro, and mix well. Season to taste with salt & pepper. Just before serving, dice the avocado and stir into salad. bookmarked this for my next potluck!! This just needs a couple of heaping tablespoons of sour cream to make absolutely perfect. Great recipe!